Originally called Taj Expressway, the project was rena med in 2008 by Yamuna Expressway Industrial Development Authority (YEIDA) constituted by the state government. Apart from cutting short the travel time to Agra, the project is also expected to reduce traffic congestion on NH-91, on the old Grand Trunk (GT) road between Delhi and Kanpur and the cities of Palwal, Ballabgarh and Faridabad on NH-2. 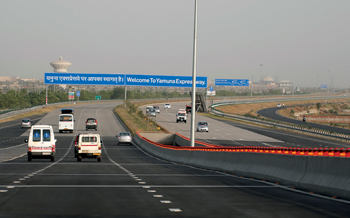 The Expressway runs along the left bank of the river Yamuna. Taking into account the high flood levels, the embankment has been designed in a manner that it is approximately three and half metres above the natural ground level. Wherever there is an underpass, the embankment height goes up, then comes down and again goes straight up to accommodate another underpass. At some places, the height goes up to a maximum of seven to eight metres which means a lot of earthwork was undertaken during construction. The construction methodology involved dividing the entire expressway into 15 to 16 packages for earthwork and awarding them to different sub-contractors who specialised in such kind of earthwork. 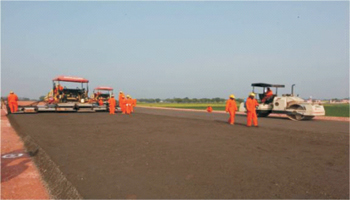 However, the major contracts for pavement were executed by two sub-contractors. “Then there were a lot of structures like interchanges, toll plazas, etc. We engaged another set of sub-contractors including Vijay Nirman, Ahuja Builders, MG Contractors, Singla, etc.,” said Suneet Juneja, Additional General Manager of Jaypee. The Pavement Quality Concrete (PQC) on the top layer of the carriageway is of 320mm thickness. The pavement is of rigid type concrete instead of regular flexible bitumen pavement. Below PQC is the 150mm thick Dry Lean Concrete (DLC) and below that is 150mm filter layer, then the earthwork, fly-ash and filling material. “The PQC and DLC contracts were divided into three packages. First 55kms is known as CP1 (construction package 1), from 55 to 110kms as CP2 and then 110 to 165kms as CP3. Oriental Structures Pvt Ltd, New Delhi completed the work on the last 55kms from Agra side while the first 55kms was handled by C&C Construction Ltd, Gurgaon and the middle 55kms was executed by Oriental and C&C,” added Juneja. Jaypee Infratech is the SPV formed by JayPrakash Associates (JAL) to execute the project as concessionaire for its client Yamuna Expressway Development Authority under the U P Government which had RITES as its consultant. JAL was awarded the contract on Engineering Procurement and Construction basis, and in turn, it engaged around 15 contractors for the earthwork, five for structures and toll plazas, and two for concrete carriageway works. However, complete design, supervision, quality control, construction planning and scheduling, major construction equipment planning and supply/installation, etc., were done directly by JAL. Construction equipment worth approximately र100cr were given to PQC contractors to ensure that the job was completed within the given time. “We are basically an engineering company. 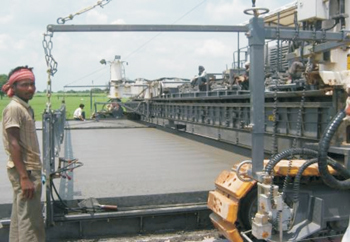 We have been into construction for the last five decades, so we know what sort of equipment and what sort of quantities of various materials are required before the start of the project itself. We never wanted our contractors to make excuses for lack of resources for slow progress. We made sure that the major construction equipment and major construction materials were directly under our control all the time,” said Juneja. 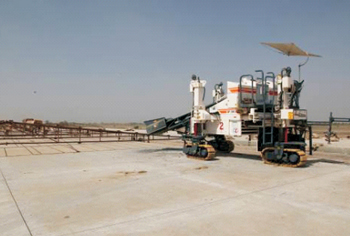 For the first time in India, JAL used 16mts wide Wirtgen pavers (4 nos.) imported from Germany for continuous paving of carriageway which is basically a three lane carriageway extendable to four lanes on either side. Since 16mts was cast in one go, there are no longitudinal joints across the direction in which traffic is moving which makes the expressway smoother.